As kids we often spent weekends with our Gran. She lived only a pushbike ride away on a neighbouring farm. Grans home was huge, she had a separate dining room with a huge circular rosewood dining table AND she had a library. A room full of books and no windows. One of the books I enjoyed was this one. It would have been a 1938 copy and was probably read by my mother as she grew up. 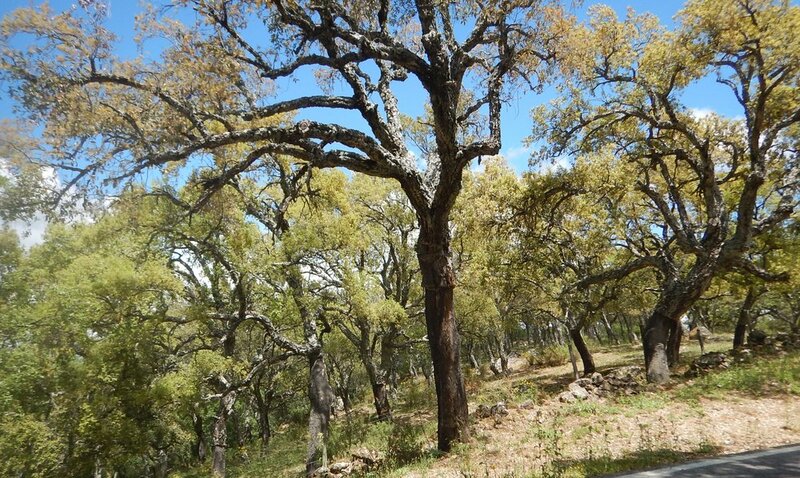 Travelling between Malaga and Ronda there are forests of cork trees. They are in oak family and seem to grow well at altitudes above 800 m. Refer correction at end of story ooops sorry, just a little bit of cradle park explorer commentary sneaking in!! Photo opportunties a plenty. Sitting around smelling the flowers, going to the bull fight ring in Ronda and not really making a connection and then to top it off, Anahid our bnb host reminded me that hugging a cork tree brings you luck. forests of cork, but where is Ferdinand?? lying around under a cork tree, smelling the flowers. Rondas historic bull fighting ring. Anahid, after she read my tea leaves!! hugging a cork tree, wondering how the cork is harvested. And there is no show without punch!! Even the bike likes smelling the flowers while resting by a cork tree. Today as I was leaving Spain and heading to France along the coast I spied this cork tree at a scenic lookout. So they obviously thrive at sea level too. You can see on the trunk where someone has removed some bark to show the cork.